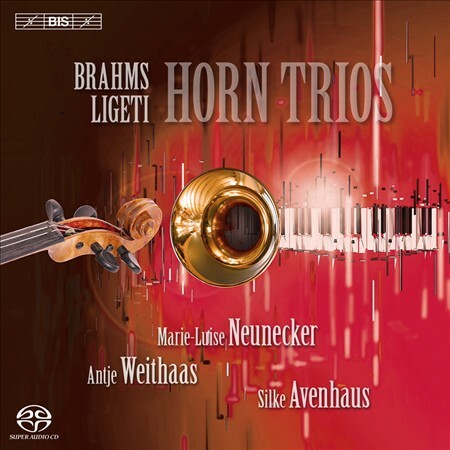 Ligeti's Horn Trio was written as a somewhat reluctant homage to Brahms in 1982. He may have been quite indifferent to Brahms' historicist approach, but this didn't stop Ligeti from writing the ideal companion piece to a chamber work, which until then had stuck out like a sore thumb in any programme. Since then, a wealth of excellent works have appeared in the genre from composers like Hans Abrahamsen, Poul Ruders and Hugh Wood, but it is the Ligeti that remains the standard coupling. That's quite an achievement considering Ligeti doesn't compromise anything about his modernist aesthetic to fit into the 19th century chamber music format. Horn player Marie-Luise Neunecker is an authority on Ligeti's music for the instrument. Ligeti's 'Hamburg' Concerto was written for her, and it was she who played the Horn Trio in the Ligeti Edition recordings that the composer supervised in the 1990s. As with everything by Ligeti, the sheer technical demands of this music limit the number of musicians willing to perform and record it. But neither Neunecker, nor her colleagues violinist Antje Weithaas and pianist Silke Avenhaus, find anything here problematic. Neunecker has a fascinating horn sound. She distinguished effectively between open and stopped timbres, but even her open sound is quite narrow and constrained. No doubt she has another sound entirely when she plays in an orchestra, but this more intimate chamber tone is very attractive indeed. It focusses her tone and allows her to integrate into the unusual ensemble, giving the full range of dynamics without overpowering in the louder passages. The Brahms is given a wistful and nostalgic air, not too much of course, but enough to bring out the feeling of reminiscence that pervades so much of the music. Again, Neunecker's slightly constrained and distant tone is ideal here, as is Weithaas' focussed but playful violin work. The performers ensure that neither the Brahms nor the Ligeti are oblivious of each other. The former is played to highlight the sense of overbearing history that Ligeti heard in it, while the latter emphasises the connections to Brahms, despite Ligeti's own protestations to the contrary. Kalevi Aho provides the filler, in the form of a new work for unaccompanied horn, Solo X. It's a work of dynamic extremes and extreme virtuosity. Placing it between the two trios was a smart move, as it shakes the listener out of the comfortable 19th century aesthetic and prepares the ear for what is to come. Aho doesn't have the subtlety or sophistication of either of his colleagues here. But it integrates into the programme largely thanks to Neunecker's distinctive tone. It is easy to spend the seven minutes of the Aho piece speculating as to which of the other works it comes closest to. I'd say it has the lyrical flow of the Brahms but the tempo and dynamic extremes of the Ligeti. Great performances and excellent SACD sound make this disc highly recommendable. It is encouraging to see that, as it turns 30, the Ligeti Horn Trio has been granted full repertory status, to the extent that a recording of the Brahms without it would now seem remiss. It's not adventurous programming any more, so any new recording has to fight on the merits of its performance. Fortunately then, this one stands favourable comparison with the best of them.